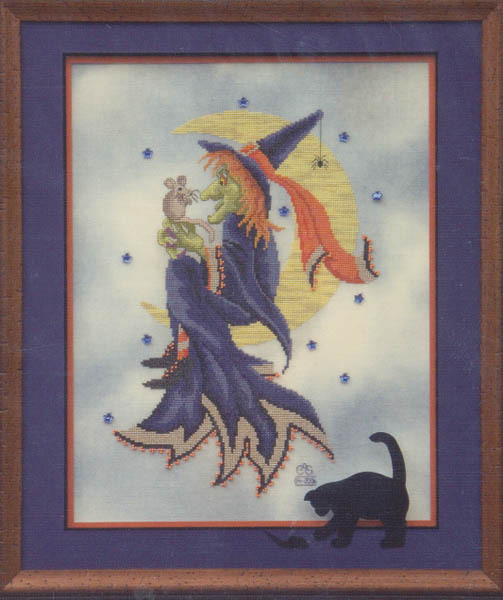 Witch sitting on a crescent moon. The stitched area is 130w x 193h with a stitch count of 123w x 189h. Model was stitched on 28ct "Storm" hand-dyed linen by Crossed Wing Collection. Q: What size is this pattern? A: The stitched area is 130w x 193h with a stitch count of 123w x 189h. Model was stitched on 28ct "Storm" hand-dyed linen by Crossed Wing Collection.